Labels and Barcodes | Infonet Biovision Home. Short description: A label is the most important marketing tool for a product. It is used to identify one product from another and also to make a decision over which product to purchase. Labelling is an important process in the food processing chain. The label is the first point of contact between a consumer and the producer. It is used to identify one product from another and also to make a decision over which product to purchase. The label is therefore the most important marketing tool for a product. It should be attractive and eye catching while at the same time being informative. A dirty, confused, untidy label will not help to sell a product. This must inform the customer of the nature of the product. It may also be necessary to attach a description to the product name. However, there are certain generic names which must be only used for their conventional uses, for example: Muesli, Coffee, prawns. All ingredients of the food must be stated under the heading 'Ingredients' and must be stated in descending order of weight. Moreover, certain ingredients such as preservatives must be identified as such by the label 'Preservatives', a specific name, e.g. "sodium nitrite", and the corresponding registration number colloquially known as an " E number", e.g. "E250". Although it is not a legal requirement to declare nutritional information on the product, if the manufacturer makes claims that the product is 'Low in Sugar', it must be supported with nutritional information (normally in tabulated form). However, as a rule it is recommended to declare nutritional information as consumers more than ever are investigating this information before making a purchase. Medicinal and Nutritional claims are tightly regulated, some are only allowed under certain conditions while others are not authorized at all. For example, presenting claims the food product can treat, prevent or cure diseases or other 'adverse conditions' are prohibited. While claiming the food is reduced in fat or rich in vitamins require the food to meet compulsory standards and grades, in addition, the terms must be used in a form specified in regulations. Use by Date - 'Use by date' must be followed by a day or/and month which the product must be consumed by. To be employed on perishable foods that usually would be kept cold, for example, fish, meat, dairy products and 'ready to eat' salads. Best before end + Month for foods with more than a 3 month shelf life. If there are any particular storage conditions for the product to maintain its shelf life, these must be pointed out. However, as a rule it is recommended to always describe the necessary storage conditions for a food product. In addition to the business name and address, it is necessary to indicate the manufacturer or packager, if independent to the main business and the seller. The food is required to specify its place of origin, especially if the name or trademark is misleading - such as if the product is called 'English Brie Cheese' when it is produced in Kenya. This is only necessary if it is not obvious how to use or prepare the product, in which case the consumer's own initiative must be used. The label must be legible and easy to read, also it must be written in English, however, the manufacturer may also include other languages. It must be possible to identify individual batches with a lot mark or batch code - the code must be prefixed with the letter 'L' if it can not be distinguish from other codes, however, the date mark can be used as a lot mark. Manufacturers must bear in mind that the smaller the size of a batch, the smaller financial consequences in the case of a product recall. The limits of preservatives artificial flavouring and colouring etc. With a best practice, the items should be presented by their approved names (i.e. domestically), functional classes, and numbers of International Numbering System (INS) or equivalent . is a labelling system for consumer products (excluding foods and medicine) that are made in a certain fashion to avoid detrimental effects on the environment. Usually both the precautionary principle and the substitution principle are used when defining the rules for what products can be ecolabelled. Many (but not all) ecolabels are not directly connected to the firms that manufacture or sell the ecolabelled products. 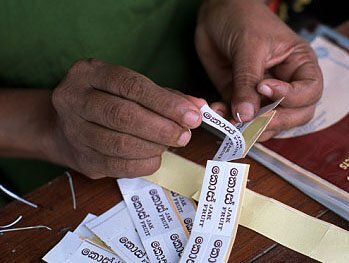 Just as for the quality assurance labelling systems it is of imperative importance that the labelling entity is clearly divided from and independent of the manufacturers. All ecolabelling is voluntary, are not mandatory by law. Ecolabelling systems exist for both food and consumer products. Both systems were started by NGO's but nowadays the European Union have legislation for the rules of ecolabelling and also have their own ecolabels, one for food and one for consumer products. At least for the food the ecolabel is nearly identical with the common NGO definition of the rules for ecolabelling. Many of the food ecolabels follow the recommendations from the International Federation of Organic Agriculture Movements (IFOAM) that started in the 1970s. The code uses a sequence of vertical bars and spaces to represent numbers and other symbols. A bar code symbol typically consists of five parts: a quiet zone, a start character, data characters (including an optional check character), a stop character, and another quiet zone. A barcode reader is used to read the code. The reader uses a laser beam that is sensitive to the reflections from the line and space thickness and variation. The reader translates the reflected light into digital data that is transferred to a computer for immediate action or storage. Bar codes and readers are most often seen in supermarkets and retail stores, but a large number of different uses have been found for them. They are also used to take inventory in retail stores; to check out books from a library; to track manufacturing and shipping movement; to sign in on a job; to identify hospital patients; and to tabulate the results of direct mail marketing returns. Very small bar codes have been used to tag honey bees used in research. Readers may be attached to a computer (as they often are in retail store settings) or separate and portable, in which case they store the data they read until it can be fed into a computer. There is no one standard bar code; instead, there are several different bar code standards called symbologies that serve different uses, industries, or geographic needs. Since 1973, the Uniform Product Code (UPC), regulated by the Uniform Code Council, an industry organization, has provided a standard bar code used by most retail stores. The European Article Numbering system (EAN), developed by Joe Woodland, the inventor of the first bar code system, allows for an extra pair of digits and is becoming widely used. Appropriate Food Packaging Fellows P and Axtell B (2002). ITDG Publishing.